Is there a child in your life who enjoys the craft of writing? If so don’t allow another minute to go by without finding a way to capture his or her sweet, funny, or surprisingly thoughtful musings. Even if they seem nonsensical today, they’ll be treasures tomorrow. Many adults forget that children have an understanding of the world that is uniquely their own. They witness and experience events with amazing clarity and contemplation; but once their tender minds become “jaded” by the realities of life, that innocence tends to fade into the background. You can turn your son or daughter’s writings into items that will last for far longer than their fleeting childhoods. Here, we’ll look at some fabulous ways to turn a little one’s literary pieces into special gifts to share with friends, family, or perhaps even the world. If you feel like blogs (short for “web logs”) are everywhere, you’re right! In fact, it seems as if every person in the universe has dabbled in blogging at least once or twice. 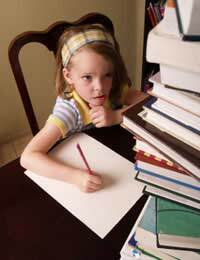 Most blogs are free, so they are a low-cost way to showcase your child’s literary creations. Even if you have a preschooler who cannot yet print, you can be the “scribe” for him or her, acting as a sort of “ghost blogger”. Though maintaining a blog doesn’t necessary mean you’ll eventually be entertaining a regular audience, you never know. The youngster in your life could just become a popular blog artist! Are there numerous songs, poems, stories, and sayings that you can attribute to your son or daughter? Rather than allow these tidbits to collect dust or turn yellow while stored in a shoebox or drawer, bring them into the light today. It’s not too difficult to scan documents (such as children’s writings and cartoons scribbled onto construction paper) into your computer for later printing. Similarly, you can transcribe difficult-to-read text into any word processing software. Isn’t personal postal service mail (as opposed to junk mail) a lovely surprise? In today’s cyber world, it’s fun to receive an “old fashioned” card. As the mother, father, grandparent, teacher, or guardian of a young person, why not help him or her turn little writings into homemade greeting cards to send right away (or keep for a special occasion, such as an upcoming holiday or birthday)? For example, even a short, simplistic poem such as: “The bird is black… He’s coming back” could make an amusing, sweet greeting card caption. And either you or your child could illustrate the piece using crayons, coloured pencils, cut-outs, or photos. Most greeting cards are eventually tossed; but a handmade one by your child will likely have a long “shelf life” in someone’s home or office. Only your imagination will stop you from coming up with new and interesting ways to turn your child’s literary works into memorable presents. And don’t forget to ask him or her for ideas, too… kids are notorious for thinking “outside the box”! The greetings cards for relatives, especially grandparents, is the best idea, especially if the child also designs the rest of the card with the drawing on the front. That’s very special indeed, and something every grandparent will treasure. The same with a poem, written out carefully and given as a gift to be framed. These all make perfect gifts.